4 Bedroom, 4 Bath Islander Villa condo. Elevator. Covered parking. Access to The Isles Oceanfront Pool! One of the few handicap friendly properties on the beach! Enjoy beautiful sunsets overlooking the lagoon from the deck. Minutes from the beach and tennis courts. 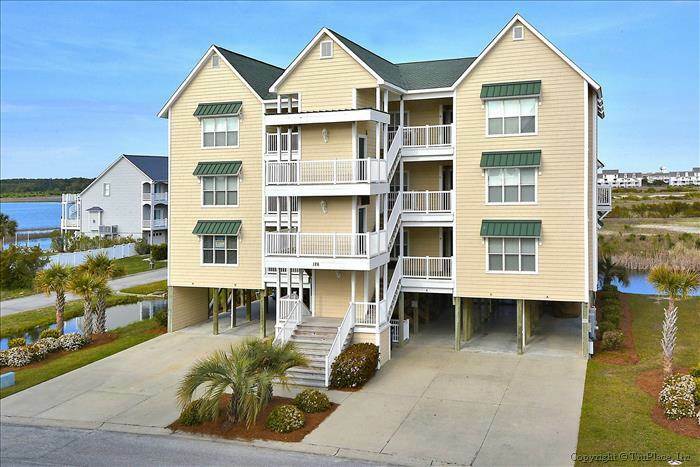 These villas are located within the Islander Resort on the west end of Ocean Isle Beach. They have 9-Foot ceilings throughout, whirlpool bath tub in master bathroom, and lots of extras including top of the line appliances. microwave, 5 televisions, 2 DVD players, CD Player, stereo, telephone (local calling only), wireless internet access, wet bar, whirlpool bathtub, tennis courts. Sleeps 12. King, Queen, Double/Double, Double/Double. All bed and bath linens provided with your rental. Beds are made upon arrival. All I can say is WOW! My friends and I decided to take a mother/daughter trip to Ocean Isle and decided to stay at IV123D. This property was beautiful! It was just as advertised and provided us with so much space. The view from the balcony over the inlet was so peaceful and we enjoyed eating, conversing, and just relaxing on the balcony daily- and my daughter loved looking for the turtles and ducks! All of the amenities were provided for and the extra beach equipment came in handy. It was just a 5 minute walk across the street to the beach, which was gorgeous in itself. The only slight (and I do mean slight) drawback is that the hot water ran out quickly when everyone was trying to shower at once, and it took forever for our clothes to dry in the dryer, but other than that no problems. ) One of the best vacations I've had in a while, and will definitely come back! I highly recommend this villa to anyone with a large party who wants to have a stress-free stay with lots of room! Thank you Sloane Vacations!